The Pedestrian and Bicycle Intersection Safety Indices (Ped ISI and Bike ISI) are a set of models that enable users to identify intersection crossings and intersection approach legs that should be the greatest priority for undergoing indepth pedestrian and bicycle safety assessment. Using observable characteristics of an intersection crossing or approach leg, such as number of lanes and traffic volume, the tool produces a safety index score, with higher scores indicating greater priority for an indepth safety assessment. Each leg of an intersection may have different characteristics affecting pedestrian or bicyclist safety; therefore, the tool is intended to provide a rating of the safety of an individual crossing (Ped ISI) or approach leg (Bike ISI) rather than evaluating the intersection as a whole. A practitioner can use the tool to develop a prioritization scheme for a group of pedestrian crossings or bicyclist approaches. This method enables the practitioner to prioritize and proactively address sites that are the most likely to be a safety concern for pedestrians or bicyclists without having to wait for crashes to occur. Researchers developed the Ped ISI and Bike ISI based on safety ratings, or expert opinion of the safety of a site, and observed behaviors, or observed interactions between pedestrians and motorists or bicyclists and motorists. These measures enabled the researchers to use a multifaceted approach to determine the relative safety of a pedestrian crossing or bicycle approach leg. To develop the Ped ISI and Bike ISI models, researchers studied 68 pedestrian crossings at signalized and unsignalized intersections in Miami, FL, Philadelphia, PA, and San Jose, CA, and 67 bicycle approaches at signalized and unsignalized intersections in Eugene, OR, Gainesville, FL, Philadelphia, PA, and Portland, OR. To develop the safety ratings, evaluators knowledgeable about pedestrian and bicyclist issues viewed illustrations and videos of the pedestrian crossings and bicycle approaches, as shown in figure 1, and rated the sites according to their perceived level of safety for a pedestrian or bicyclist. Researchers asked the evaluators to view the illustration and video as if they themselves were pedestrians crossing at the crosswalk or bicyclists approaching the intersection. The evaluators then rated the sites on a scale of one (most safe) to six (least safe), according to their sense of safety and comfort. Figure 1. An example of an illustration and a screen capture from the video shown to evaluators. 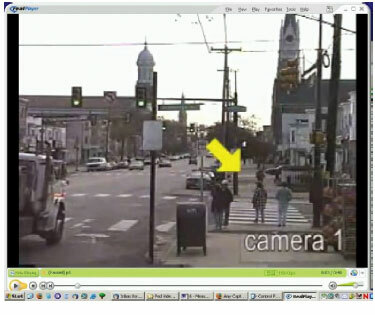 To evaluate observed behaviors, researchers videotaped each site and watched the tapes to record the behavior of pedestrians and bicyclists when they interacted with motorists. Recorded behaviors included changes in speed or direction by a pedestrian, bicyclist, or motorist in response to the presence of another party. The researchers, for example, would record instances when a pedestrian stopped before or during a crossing because of an oncoming vehicle or when a right-turning vehicle slowed down or stopped to avoid a bicyclist. These interactions included avoidance maneuvers (any change in speed or direction) and conflicts (sudden change in speed or direction). In total, the researchers observed 1,898 bicyclist-motorist interactions and 1,095 pedestrian-motorist interactions. As shown in table 1, the Ped ISI model consists of one equation that determines the safety index score for a single pedestrian crossing. Table 1. The Ped ISI model is shown. As shown in table 2, the Bike ISI consists of three equations. Each equation determines the safety index score for a single bicycle movement, either straight through, left turn, or right turn. Table 2. The Bike ISI model is shown. The Pedestrian and Bicyclist Intersection Safety Indices: User Guide (FHWA-HRT-06-130) is a companion document to the research report that provides the practitioner the information needed to implement the Ped ISI and Bike ISI. It covers the data needs, presents the models, and provides examples of how to use the Ped ISI and Bike ISI. It also includes quick reference tables, such as the one shown in figure 2, that enable users to determine a safety index value for a site without the need for a calculator or computer. Figure 2. An example of a quick reference table found in the User Guide. Carter, Daniel L., William W. Hunter, Charles V. Zegeer, J. Richard Stewart, and Herman F. Huang, Pedestrian and Bicyclist Intersection Safety Indices: Final Report, Federal Highway Administration, Washington, DC, Report FHWA-HRT-06-125, 2006. Researcher—This study was performed by the University of North Carolina Highway Safety Research Center, Chapel Hill, NC. Availability—The publication from which this TechBrief was developed, Pedestrian and Bicyclist Intersection Safety Indices: Final Report, (FHWA-HRT-06-125), will be available from the National Technical Information Service, 5285 Port Royal Road, Springfield, VA 22161. A limited number of copies will be available from the Research and Technology Product Distribution Center, HRTS-03, FHWA, 9701 Philadelphia Court, Unit Q, Lanham, MD 20706, 301 –577–0818 (telephone), 301–577–1421 (fax).